Regulations and Approvals Expert Working Group (RA-EWG) is an industry association driven expert working group promoting regulatory convergence, with the ultimate goal of expediting the launch of innovative medicine in Asia. Through close collaboration among 13 member associations, RA-EWG aims at making practical proposals for our stakeholders -regulatory authorities and applicants in each economy - on shared regulatory issues in Asia. Specifically, RA-EWG engages in the following two tasks in close collaboration with Asian regulatory authorities. APAC Good Submission Practice (GSubP) guideline is a document for best practices proposed by RA-EWG under the concept of Good Registration Management, aiming at improving the quality of the submission. APAC Position Paper is to provide high level suggestions and proposals to regulatory authorities from the viewpoint of the industry. 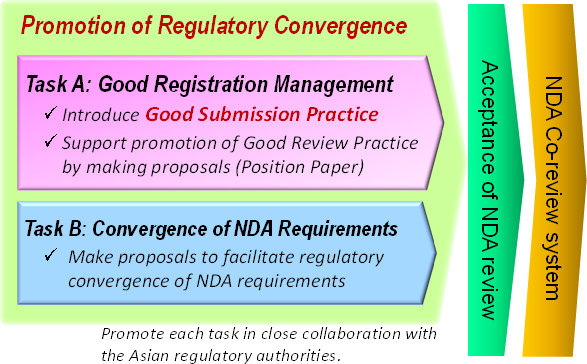 Make Proposals to facilitate regulatory convergence of NDA requirements based on gap analysis. We hope these activities would contribute to realizing regulatory convergence in NDA/Approval processes and eventually leading to mutual acceptance of NDA review reports or co-review among regulatory authorities.